This week’s Teacher Tuesday post is all about How to Read a Story by accomplished storytellers Kate Messner (author) and Mark Siegel (illustrator) chronicle the process of becoming a reader: from pulling a book off the shelf and finding someone with whom to share a story, to reading aloud, predicting what will happen, and-finally-coming to The End. This picture book playfully and movingly illustrates the idea that the reader who discovers the love of reading finds, at the end, the beginning. SUMMARY: Accomplished storytellers Kate Messner (author) and Mark Siegel (illustrator) chronicle the process of becoming a reader: from pulling a book off the shelf and finding someone with whom to share a story, to reading aloud, predicting what will happen, and-finally-coming to The End. This picture book playfully and movingly illustrates the idea that the reader who discovers the love of reading finds, at the end, the beginning, while also telling a story within a story that students will love – about a princess, a dragon, and a robot, who overcome their differences to be friends in The End. RECOMMENDED AGES: 4 – 8 year olds (Grades K – 2). MY THOUGHTS: How to Read a Book by Messner and illustrated by Siegel is an engaging, funny, and beautiful book that children will love (trust me – my students absolutely adored this book!). It is fun, simple, and the illustrations perfectly suit the tone of the writing, supporting the text and adding rich details to this unique picture book. This book has the potential to serve as a mentor text for younger students, whether its used to support the development of good reading practices in the classroom, or as a mentor text for a Procedural Writing Unit. Hi Bookworms (and teachers)! If you’re reading this, it means that you have intentionally (or perhaps unintentionally) stumbled upon my newest feature – Teacher Tuesdays! This idea came to me as I was planning for an upcoming Language Arts unit, and realized that perhaps others could benefit from reviews of the children’s books I am using in with my class. I have also decided to include potential lesson ideas and activity inspiration at the end of these posts (for those of you who are teachers, or who work/interact with children in some capacity). Each Teacher Tuesday review will contain a summary of the book, a recommended age range, my personal thought on the book, and potential classroom applications (linked to Ontario Curriculum). 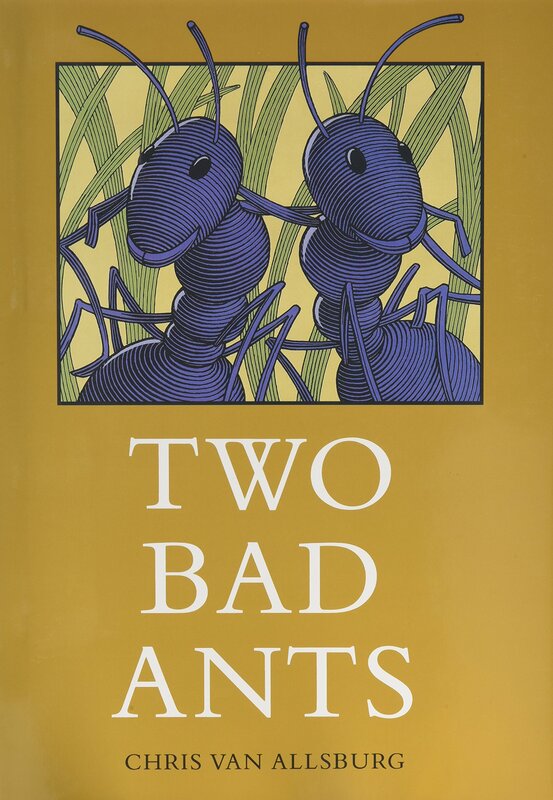 This week’s Teacher Tuesday post is all about Two Bad Ants by Chris Van Allsburg, which tells the tale of two ants who decide to leave the safety of the others to venture into a danger-laden kitchen. SUMMARY: Accustomed to the orderly and uneventful life in the ant hole, all the ants enter the bizarre world of a kitchen in the search for sugar crystals for the queen. Two greedy ants stay behind in the sugar bowl, eating their fill and then falling asleep. Their slumbers end when a giant scoop drops them into a sea of boiling brown coffee. Further mishaps include a heated stay in the toaster, a hazardous swirl in the garbage disposal and a zap in an electrical outlet. When the ant troops return, the two bad ants gladly rejoin their friends and head for the safety of home. RECOMMENDED AGES: 4 – 8 year olds (Grades K – 2). Older children may also enjoy reading Two Bad Ants independently. MY THOUGHTS: Two Bad Ants has dazzling artwork that highlights the ants’ point of view, and children will be fascinated by the ant-eye view that Van Allsburg provides of common everyday items, such as sugar, coffee, and a toaster! Van Allsburg’s illustrations observe the world from unusual angles and perspectives as readers follow the ants on their journey. This book has the potential to serve as a mentor text for a variety of age groups and for a variety of topics, such as Voice (Point of View) and Descriptive Writing.